We had to include Encyclopedia Brown in our book, of course. I for one was never able to solve his cases because I was terrible about knowing any of the random trivia he knew. Here are the 10 most ridiculously difficult EB mysteries. I remember the ginger ale one so clearly, with the art of the blind guy putting it inside the safe. And another one that I think was an Encyclopedia Brown but could have been Two-Minute Mysteries, where someone claimed to have been awakened by thunder and then saw a crime committed in the light flash from some lightning. But lightning comes before thunder, so that couldn't have happened. I think of that whenever there's a storm. 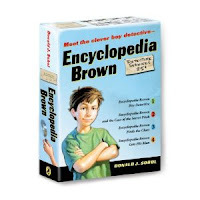 Did you read Encyclopedia Brown? Remember any of his cases and the random trivia with which he solved them? I remember two. One had someone finding ambergris on the beach which is apparently used in perfume and it's something like whale mucas. That's all I remember about hat one. And one was in my reading text book and the mystery was how one twin won a race after eating a bunch of blueberry pies, but Brown proved the twins switched because only one had berry stained teeth. Love this! The only one I can remember solving involved a sword (or something similar - bayonette?) gifted to a Civil War hero supposedly just after the first battle of Manassas. The engraving referenced the "first" battle, but was dated before the second battle happened, which led EB to deem it a forgery. I felt so smart figuring that out! 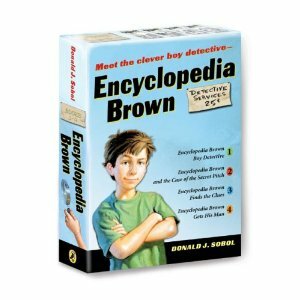 Encyclopedia Brown books were the first books (aside from comic books and MAD magazines) that I actually enjoyed reading. I remember one case in particular about a "ghost" lady who would walk along a beach in a white dress -- everyone knew she was a ghost because she left no footprints. E. Brown figured out that her dress didn't billow in the wind, and that she had a heavy board attached to her skirt that would erase her footprints in the sand. I don't recall the point of all that, but I do remember that detail.